Uses a T7 promoter and RBS B0034 (BBa_B0034) to express Lwa Cas13a (BBa_K2323000) flanked by a 6x His-Tag to allow purification and a SUMO-tag to improve solubility. This is terminated by a Tphi terminator. The whole coding sequence is also available as BBa_K2323001. 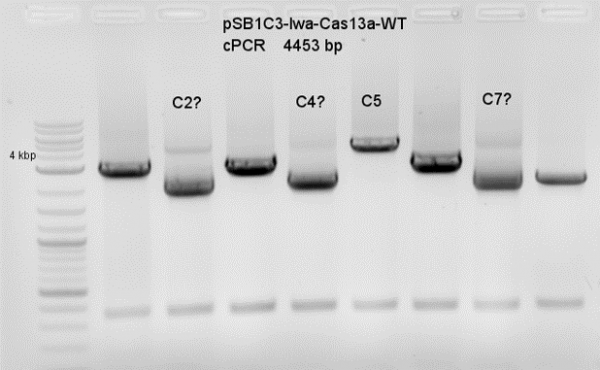 Cas13a from Leptotrichia wadei (Lwa) is class 2 type VI CRISPR-Cas effector. It is capable of targeting specific ssRNA and cleaving them using its bounded crRNA as guide strand. Unlike other ssRNA CRISPR-Cas effectors, Cas13a is capable of processing the precursor crRNA (pre-crRNA) by itself, cleaving, binding the RNA sequence and then building the Cas13a:crRNA surveillance complex. One characteristic of Cas13a along with other type VI members is its ability to degrade other RNA strands regardless of their sequences, provided the protein has been activated by binding and digesting the target sequence complementary to the crRNA. This "collateral activity" makes Cas13a a powerful biological tool, as unspecific RNA degradation can be triggered on command by providing the target RNA. The Biobrick contains a promoter, RBS B0034 and Lwa-Cas13a with a His-SUMO-Tag, that allows for easy expression and purification. 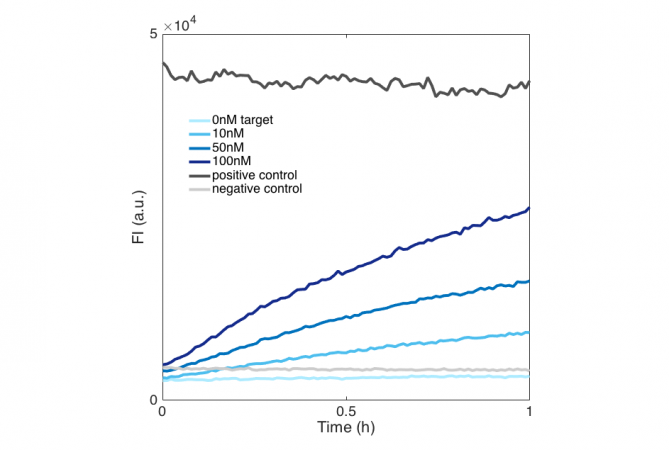 The SUMO-tag increases solubility and can be cleaved off with a SUMO-protease after the affinity purification. 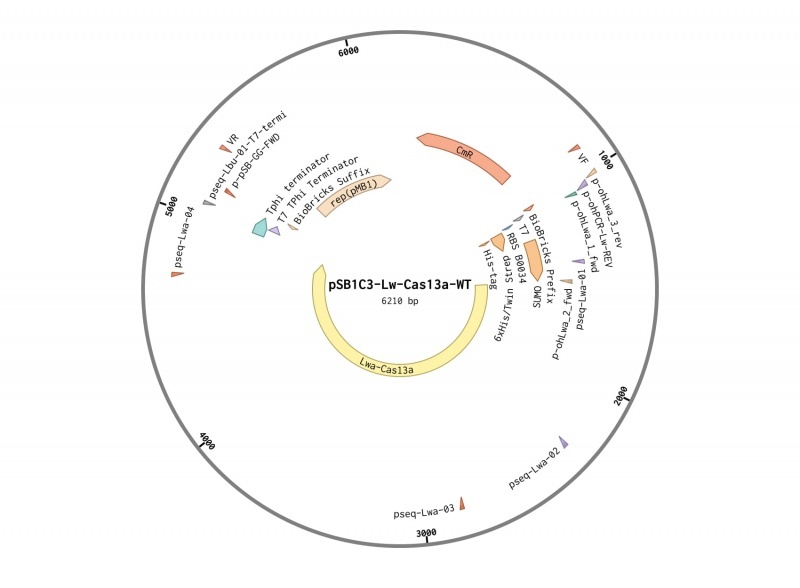 The plasmid map shows pSB1C3-His-SUMO-Cas13a which was cloned by the iGEM team Munich 2017 via Golden Gate cloning. The binding sites of used primers and all other components are annotated. We ordered Lwa in 2 gblocks from IDT, ready for Golden-Gate-Assembly. We ligated it into the pSB1C3-ccdB by restriction digestion of the backbone and having adequate BsaI sites within the gblocks. We confirmed the cloning by colony-PCR, analytical restriction digest and sequencing at GATC. The colony was stored as a Cryo-stock at -80 °C. This colony PCR confirmed c5 as a positive colony. We made a overnight culture, isolated the cloned plasmid and checked it via analytical restriction digest. After those positives results we sent the part for sequencing with all the 4 sequencing primers plus VR and VF (see plasmid map above) to get a full read. As the sequence was ordered codon optimized, we could express it in BL21 star. Expression was done overnight at 16 °C in 2xYT media in the pressence of 1 mM IPTG. 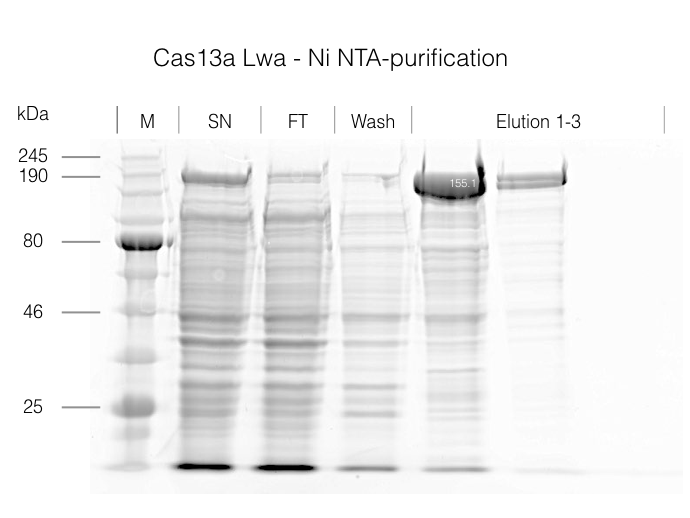 Ni-NTA-Purification of overexpressed Lwa-Cas13a. Supernatant and Elution 1 were used in the characterisation experiments. We show below, that Cas13a gets activated upon target binding in a concentration dependent manner. In this case, we detected a fragment of the 16S rRNA of E. coli in a plate reader experiment by using the RNaseAlert system readout. After less than 30 minutes a difference between a target containing sample and the negative control (sample without Cas13a Lwa) is visible for both the purified and the unpurified Cas13a. 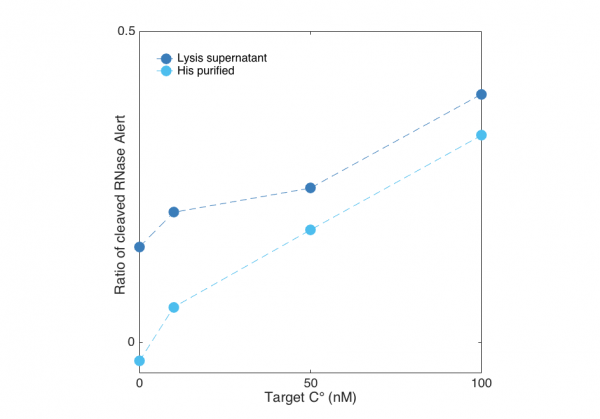 However, the unpurified Cas13a has a visibly larger activity at low target concentrations, and even shows cleavage at 0 nm target. This is probably attributed to residual RNases that are within the cellular lysis mix. The positive control contained RNAse A, which cleaved all RNAseAlert before the measurment could be started in the plate reader. When plotted against each other, the previously mentioned residual activity becomes even clearer. For this reason we suggest a proper purification of the protein to get reproducible results.